Revaluation of asset is not carried out by the company in Indonesia today. This prompted Finance Minister Regulation Number 191/PMK.010/2015 on revaluation for tax purposes. Revaluation of assets in general purpose is to increase the firm's value and presents an account at the real values. This research investigating the activity of asset revaluation carried out by a public company in Indonesia based on auditor quality and monetary unit of financial statement presentation. This research investigate 434 firms during the years 2012 to 2014. The results showed that 7.1 percent of the firmsrevaluation of assets and 92.9 percent have not been revalued their assets. Firms that revalued their assets, 3 percent of them audited public accountant firms affiliated with the Big 4 and 4.1 percent of them did not. The number of issuers that revalue assets and presents its financial statements in the rupiah currency as much as 5.3 percent and 1.8 percent in US dollars. Bawono, I. R., & Singgih, E. M. (2010). Faktor-Faktor dalam Diri Auditor dan Kualitas Audit, Studi pada KAP “Big Four” di Indonesia. 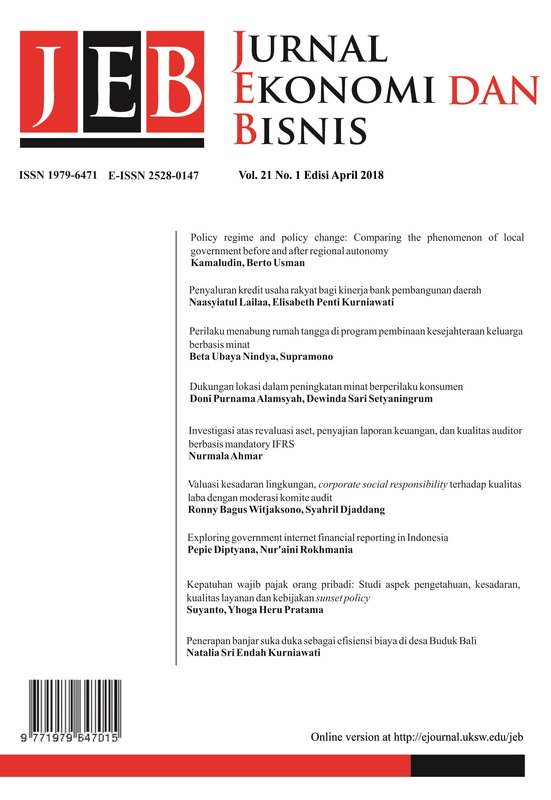 Jurnal Akuntansi Dan Auditing Indonesia., 1–20. Cheng, C. S. A., & Lin, S. W. J. (2009). When do firms revalue their assets upwards? Evidence from the UK. International Journal of Accounting and Information Management, 17(2), 166–188. Goodwin, J., Sawyer, K. R., & Ahmed, K. (2005). Value Relevance And Information Heterogeneity. Pacific Accounting Review, 17(2), 4–33. Hu, F., Percy, M., & Yao, D. (2015). Asset revaluations and earnings management: Evidence from Australian companies. Corporate Ownership and Control, 13(1CONT11), 1287–1296. Matthews, R. L. (1968). Income, Price Changes and the Valuation Controversy in Accounting. Accounting Review, 43(3), 509–516. Missonier-Piera, F. (2007). Motives for fixed-asset revaluation: An empirical analysis with Swiss data. The International Journal of Accounting, 42(2), 186–205. Mura, A., Piras, F., & Valentinčič, A. (2015). Do asset revaluations signal future performance of private firms? 39th EAA Annual Conference. Nadeak, E. (2011). Pengaruh Revaluasi Aktiva Tetap terhadap Penghematan Pajak pada PT. Kabelindo Murni. Universitas Gunadarma. Rupić, B., & Bonić, L. (2015). Fair Value Concept Specifics in Financial Reporting and Auditing. Economic Themes, 53(1), 119–141. Saito, S. (1983). Asset Revaluation and Cost Basis: Capital Revaluation in Corporate Financial Reports. The Accounting Historians Journal, 10(1), 1–23. Santoso, U. (2012). Pengaruh Pengungkapan Akuntansi, Akuntansi Konservatif, Komite Audit dan Kualitas Auditor Eksternal Terhadap Manajemen Laba. Jurnal Akuntansi, 16(1), 1–21. Shin, G. H., & Willis, V. F. (2014). Asset Revaluations Under International Accounting Standard 16: Evidence From Korea. International Journal of Business, Accounting, & Finance, 8(2), 21–36. Tay, I. (2009). Fixed Asset Revaluation: Management Incentives and Market Reactions. Lincoln University, New Zealand. Wali, S. (University O. S. (2015). Mechanisms of corporate governance and fixed asset revaluation. International Journal Accounting and Finance, 5(1), 82–97.